Two weeks of intensive training with all manner of air power means Type 45 destroyer HMS Diamond is at the top of her game on patrol in the eastern Mediterranean. The Portsmouth-based air-defence warship and her 200 crew have been tested by fighter jets including Tornados, Typhoons and F16s, plus E3 surveillance aircraft and Voyager transporters in the skies above and around Cyprus. And just for good measure, she tried her hand at anti-submarine warfare – aided by one of the Royal Navy’s hunter-killer submarines. The destroyer made extensive use of the facilities and equipment at Britain’s bases in Cyprus. The variety of aircraft using the airspace over and around the area tested the team in the ship’s operations room – especially the Fighter Controllers, whose job is to direct friendly fighters to intercept targets. They also control congested skies, observe and direct numerous different aircraft and operate with other UK forces. 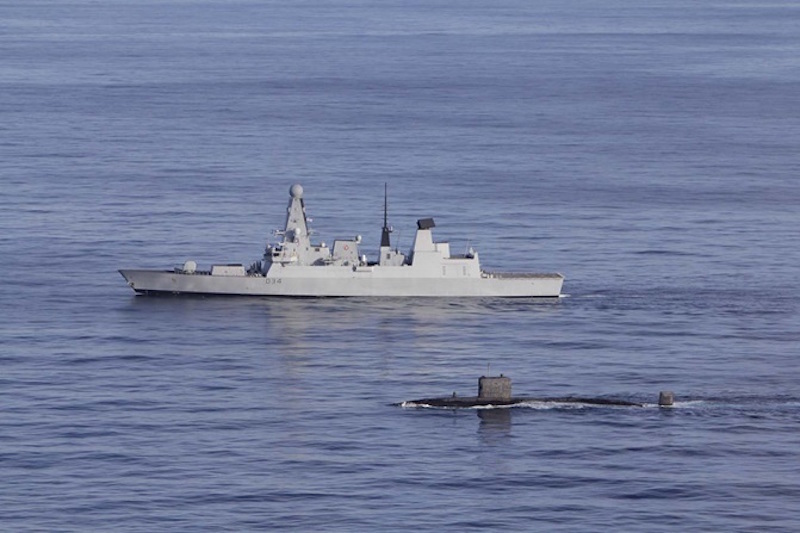 “All this proves our ability to deploy, operate and sustain ourselves for however long is required,” said Commander Ben Keith, HMS Diamond’s Commanding Officer. “Type 45 destroyers are one of the cornerstones of our modern navy and this training enables us to demonstrate our ability to exercise and operate with armed forces both internationally and across defence. Having mastered command of the eastern Mediterranean skies, the ship switched focus to honing her gunnery skills. She fired live rounds from all her guns – from the main 4.5in gun on the forecastle to the automated 30mm gun, the Phalanx automatic Gatling gun which spews 20mm rounds at incoming fast-attack craft and missiles at a rate of 3,000 per minute (50 every second) down to small arms, Diamond’s last line of defence against all attackers. The gunnery team was assisted in improving its accuracy by ‘spotters’ – crew of the ship’s Wildcat helicopter who went aloft to observe and direct some of the firing. 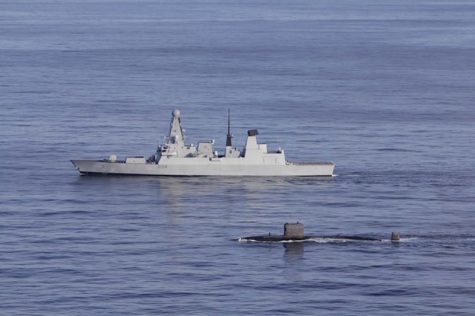 Observing much of these goings on were the crew of the submarine who joined Diamond for a combined anti-submarine warfare exercise – where the two try to ‘sink’ each other. The destroyer used her sonar and Wildcat helicopter – armed with Sting Ray torpedoes – to hunt the Trafalgar-class boat, which in turn sought to get Diamond in her periscope cross-hairs without being noticed, a challenge made harder by the near-glass like state of the Mediterranean. Before the exercise got going six crew members of each vessel traded places to see ‘how the other half live’. For most of the submariners, this was their first chance to step on board a Type 45 Destroyer. After a long day of playing cat and mouse between the submarine and the ship, the guests returned and the two warships resumed their patrols. Diamond left home at the end of September for an autumn deployment conducting security operations in the eastern Mediterranean. Venturing into these waters has allowed her crew to honour their forebears. A service of remembrance was held and a wreath cast into the water over the wreck of the WW2-era HMS Diamond, lost off the Peloponnese at the end of April 1941. The ship’s company also enjoyed a few days’ down time in Souda Bay in Crete. As Diamond’s deployment ruled out the participation of her crew in the Great South Run in Portsmouth, they ran the ten-mile race around the NATO base – with the first two miles all uphill. The fastest runner posted a time of 1h 18m – a good half hour behind the winner of the real thing in Hampshire. After loading stores and provisions in Crete, Diamond has returned to the seas around Cyprus for continued training with NATO and UK forces operating in the region and to conduct maritime security patrols.